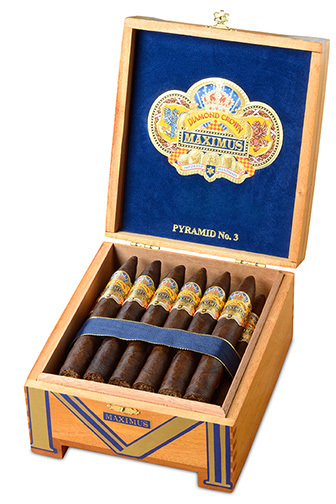 Diamond Crown Maximus cigars are the result of three legendary cigar families ~ the Newmans, Fuentes, and Olivas ~ joining forces to create one amazing line of cigars. When Stanford Newman, then president of the J.C. Newman Cigar Co., introduced the Diamond Crown in 1995 his goal was to create the best cigar his family-owned company had produced in its 100-year existence and it became wildly successful. A decade later, Stanford again challenged Carlos (Carlito) Fuente, Jr. to create a bold, rich, robust, and fuller-flavored complement to Diamond Crown. It took Carlito more than 3 years to develop the Diamond Crown Maximus' complex, fuller-bodied taste, but he succeeded with a secret blend of aged Dominican filler tobaccos and a special Ecuadorian wrapper grown exclusively on the Oliva family's Ecuador plantation in the El Bajo region. Carlito selected the richest, hardiest and darkest tobacco leaves taken from the corona of the plant, creating a unique and remarkably smooth, full-flavored cigar. The taste of the perfectly constructed Maximus falls somewhere between a cappuccino and a double espresso, neither delicate nor intensely powerful.